This is “about us” (well no… more about me really). It is where I get to tell everyone how great we are. I will tell you all the tall stories about how gifted we were as kids. Also how close I personally have come to being awarded the Nobel Prize for services to the jewellery industry… Hmm, well Ok maybe not. Let’s try and do what we do best and tell it how it is. At this point, I am going to add that I think it’s better for people without self-interest to tell you what we are capable of. The site we have put together is not so much about us or me. The site is about all the great rings we have made for all our great clients. You can have a look at what people have said about us in the Testimonials page after you get bored with this bit, or check out our google Reviews. My name is Ian. I’ve been in the jewellery trade for over 36 years. I started my apprenticeship in the UK before heading to Aus to make my fortune (still working on that part). As a jeweller and diamond setter, it is a never ending learning curve because there is so much involved in what we do. The more experience you have making rings, the better you get at it. There is no way to fast track what we do, you just need to put in the hours. I personally have well over 70,000 hours sitting at the bench making jewellery. It is never dull, although working on such a small scale can be very frustrating at times! At the end of the day, when you have produced a great looking ring for someone, it is very satisfying. I have spent my entire working life making jewellery. Naturally, after all that time, you do tend to get the hang of it. I pass this knowledge on to clients. I think it is all part of being a good jeweller. Listening and interpreting the requirements of clients, helping to get the best result. 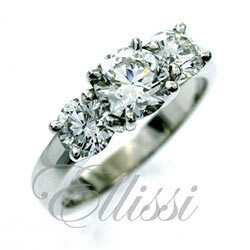 Collectively at Ellissi we have many decades under our belt making shiny things, in fact it must be close to 80 years. At Ellissi, we are not like the main street stores you wander into. In jewellery shops you can be made to feel uncomfortable. When you visit us, you will find us to be very friendly and informative. You will learn a lot about diamonds. Our studio workshop is in the heart of Melbourne. It is easy to find and handy for transport. This is as hands on as you can get, unless you are making the ring yourself of course. There are no designated “sales only” staff. The people you deal with are the people who will design and make your ring. We are experts in diamond selection, dealing directly with diamond cutters. We will obtain the best possible diamond for the budget you have and will take the time that is needed to decide what is best. I take a great deal of care to explain and show to clients the intricacies of diamonds. It is a very complex area of course, so we like to inform people about the reason one diamond will cost more than the next. It is not just a case of pick a grade and buy the cheapest. You will gain a proper understanding of the process, which makes an enormous difference to your decisions. We will explain how you can get best value for money and the correct balance of grades. Selection of diamonds requires good guidance. I think what we do to inform and educate our clients about their purchase is very important. In terms of money and significance, the purchase of an engagement ring is one of the most important decisions we make. It is now possible with the aid of email and digital photography, to give a really clear demonstration of the work we do. Many clients make their purchase without actually seeing us in person. In fact we have clients not only all over Australia but also overseas, many we never get to meet. I think this actually says a lot about us and what we offer. When you are in town, we are always happy to meet and discuss your requirements. Keep in mind we are manufacturers working to many deadlines, so appointments must be made. If you are hunting down options for diamonds contact us to make an appointment or discuss your requirements. Give us a call or I am more that happy to respond via email if you have any detailed questions about the process of making your engagement ring. All you need do is ask.